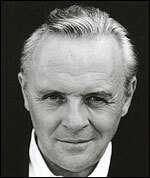 Anthony Hopkins was interviewed by Quentin Falk at the National Film Theatre on 25 June 1989. Question from audience: Which do you find easier and which do you enjoy the most? AH: Well film is the easiest; it's more concentrated, it is easier. And to be absolutely practical about it, if you're in a play and you're not very good in the play, you're stuck with it for six months and it's a nightmare. You know, if you're in a film and the film doesn't work out well, well you've done it. That's being pretty prosaic about it or philistine about it really. But I enjoy film, I just love the process of it. I love getting up in the morning going to the studio, going to the location - I love it! I love the nitty gritty of it all. QF: It's the best paid, isn't it? AH: It's the best paid. [Laughter] But it's just the immediacy of it. I don't know, it's - you go on location and the location does the acting for you and you just turn up; you show up and you respond. I think those marvelous John Ford movies, you know, with John Wayne and James Stewart - how wonderful. Because there you have all the scenery - all the fantastic pieces of God's sculpture, you know, the Arizona desert and - I'm entertained actually; when I'm doing a film I feel entertained by the whole process, more so than I do in the theatre. Although, if you're in a successful play and the play is working well - I mean successful because the audiences like it, the audiences respond well - it's a pleasure. I'm enjoying one at the moment, I'm having a wonderful time. The exercise is then to keep it fresh all the time, and that in itself is quite challenging. You know, to keep it happening all the time, so it's different to last night. AH: I've always been hopeless at everything when I was a kid. That's why I became an actor - 'cause I couldn't do anything else. And then I went to RADA [Royal Academy of Dramatic Art] for some training and I began to gather together a sort of technique for myself. I understood that there was something required of an actor, that you couldn't just walk on stage and speak, that you had to do a lot of training, or had to have a lot of experience. I was a bit of a misfit then and I didn't fit in at all, I couldn't quite get it, but I was pretty rambunctious, so I managed to succeed through a kind of mutinous personality. I don't say that with any self-aggrandizement, it was the only way I could cope, you know. I made a lot of noise and jumped about a lot, and they gave me some nice parts. I always liked to take the plunge, you know, I'd jump in at the deep end and hope that I'd find land somehow, or hope I'd float or survive. That's more or less the way I've gone through my life. QF: At somewhere like RADA, I mean is there ever any suggestion of talking about film technique. QF: Were you surprised? Do you think there should be? Is there now, I wonder? AH: Well, I think in this country for a long time, until quite recently, we've had rather a sniffy attitude about films, in the theatre profession. I remember when I went off to Hollywood, it was, 'Why are you doing that? You know, you should be sweating here at the Old Vic. You should be doing serious stuff,' and I don't buy that, I can't go along with it. It's only recently, in the last decade I suppose, that, you know, the film industry's opened up and television, of course, has made a great impression on people and actors have to learn a film technique. But in those days, which was just almost thirty years ago now, there was no technique taught for television or film. And it is a technique. QF: Certainly when you were starting to get the good roles at The National [The National Theatre], you were also beginning to do a lot of television at that time, certainly at the end of the 60s and the beginning of the 70s. So was that like a leap in the dark, or was it - I mean were they very similar techniques? Did the directors particularly help? QF: Not film even at that stage. AH: I think it's all just common sense, you know. You scale down. QF: You're mystifying it too much. AH: No, I think if - you know, you say, 'Well, you have to have a very naturalistic, realistic conversational approach to a film.' Well, I think also there's a trap in there because sometimes you have to give a big performance on film. It depends on the kind of person you have to play. So you have to have a third eye, really. You just have to judge where you're going on a film. You know, what sort of character you're playing. I mean how much grit, how much power, to give. I mean but you can't blast away at the camera. I think one of the things you have to have is a respect for the camera, a real respect, and a real love for it, and to really, when I say take it seriously, quote 'seriously', I mean not patronize it. It's a big mistake to patronize it and think it's a third rate medium, because it's not, it's a great art form. QF: [presumably repeating audience question] There's a great reality in Hopkins' acting. Any kind of emotional preparation before he goes on? AH: Um no, not at all, really. It depends. I mean if there's a - I can't describe it, really. I used to try - some years ago, I used to stand in the wings, or I'd stand, you know, getting myself into a state before I'd go on and by the time the camera or you're ready to go on, it'd all go. And Stanislavsky talks about, you know, the preparation, and then Stanislavsky changes his mind as years went by that the processes change. I think, you see, if you come on stage or on a film set and - I was doing a film down in Wales called Heartland, and I had to have a gun, and I had to threaten these two characters in this hut, and when you've got a gun in your hand, and it's raining and it's muddy and you've got to put on rage, it's very easy. [Laughter] And I was particularly irritated that day because I remembered something, some slight some weeks before, something that was in my mind about a group of people. I thought, 'Right, I'll use that!' But once you start, I think, once you say - I don't want to blast the microphone - once you start SHOUTING, you see, and once you start getting in an emotional state, and once you start - let's just take anger, and you just produce a sound on stage and you go OY! You do a bit more, and you do a bit more - what happens is you're triggering mechanisms in your brain and nervous system so you start to feel that action, you start to feel angry. There's a trick actually on Elephant Man how to produce tears. How you can actually, um by producing tears - you can actually stare at a point if you can design it in a way - it's all very tricky this - and you look at a point, and don't blink, your eyes start to water. Once they start watering, you start to feel very emotional, and then a tear can just drop, you see, and it all looks like magic and all that, but it's a trick. It's all a trick, really - everything is a trick. There's no truth in acting, it's all a trick, because you go on stage in front of sets, you're on film - it's all a trick. I'm making it sound very - I really am demystifying it, but what I try to do, what I do, and I hope effectively, is to create a reality as if it is happening now, that you're fishing for words out of the air. And so you go on stage every night, and I think, 'Well, how can I make this different to the last night?' So what I say to myself constantly - and once you know a play well enough, or if you know your script well enough, whether it's in film or television or the theatre, if you know the text, the words, so well that at any moment you can respond to a line if someone throws you a cue like tennis or you know, you know the script so well. So what I do is I go over in my mind, I say, 'Now, now, now, now, now, now, now, now, now, now.' That word goes through my mind over and over again on each line. So I repeat it like a mantra until I get into a state of mind where it's happening again and anew. But it is all a trick. I think in order to produce - I remember I had to produce an enormous well of tears for something some years ago on a scene, and which was a very painful scene. It was in a rather strange re-make of Dark Victory, and I had to really cascade in tears of grief, and I spent a morning because they weren't getting to the scene on time. I had to build and build and build, and I had a tape recorder with some music which was very poignant, and I built this pressure up until they actually said, 'OK,' and I said to the director, 'Can we do this in one take?' and he said, 'Yeah, if we can,' He said, 'Action', and it all worked. Some nights you might go through an entire performance and not feel a thing, and the audience may have a much better time, 'cause if you're enjoying yourself on stage too much, they're having a terrible time because they can't hear you. [Laughter] And if you're a woman your mascara's running. QF: But as a kid, you were a film fan. I mean you'd go to your local cinema and see whoever the stars of the day were many times. And you've said that you basically wanted to go into acting to be a film star and above all that to be famous, basically. AH: That's all I did, yeah. I couldn't do anything else, really. I don't think it was unique, you know, that we were brought up [unintelligible]. [Laughter] In the war years, and in the post-war years, cinema was the big thing. I mean everyone went to the cinema so millions of kids went to the cinema, millions of children went to the cinema, and I was one of them. And my favourites were those flickering, dark Warner Bros. movies. I loved gangster films like The Last Gangster and Scarface and Angels with Dirty Faces. My favourites were Humphrey Bogart, James Cagney, Pat O'Brian, and all that, such matters. And I found I was fascinated by them. I was particularly fascinated by Bogart, I think because he reminded me of my grandfather so much. I had a great passion for Bogart, as I believe a lot of people have for some reason. He had one of those extraordinary cultish personalities and he's a bigger star today than he was when he was alive. So that's what I mean. I wasn't brought up on it, but I always went to the cinema with my parents. My father was a great movie lover. QF: But that was the kind of, if you were going to be an actor, that was the sort of actor you attained to be was it. AH: I've always liked American actors particularly. Because that was my first impression. I was very enamoured of America when I was a kid because we were surrounded by American soldiers during the war, the accent was very strange to me, it was very exotic and very captivating. And it set at an early age, when I was about six years of age, my destiny where I'd always wanted to go to America. When I went to America, I felt immediately at home there for some strange reason, and I still do. Although to be truthful, I went back last September and I didn't feel that at home there, but I felt very at peace there. I got away from this country to go and live there because I wanted to get away from everything that was stultifying about the British theatre.